„We all have the starting point of positive changes in ourselves. The secret of our prosperity lies in the way how we deal with our intelligence, our feelings and our senses” – told German psychologist and hypnotherapist Erhard F. Freitag. I think this is a wise truth, and I have learnt the same thing from Sherlock Holmes. I am happy and lucky. The cause of that is partly the great detective, but mainly the fact that his creator, Arthur Conan Doyle knew a lot about life and he willingly shared his knowledge with the world. Life is suffering, taught Buddha, and there is no plant, animal or human being which will have an easy life. Everybody has problems and all of us have to face with difficult situations. I am no exception. For a long time I believed that the world is cruel, life is awful and every change brings fear. Fortunately Sherlock proved that I erred. When I was a child I learned how important studying is. At elementary school we read a tale in which a crab explained to a bear how he swims. Later this information proved to be useful, because once I slipped off of my life saver in a pool, but I began to flap and thanks to this I did not sink and my mother could jump into the water and save me. So I realized that I can learn many practical things in school. But I did not like required readings, and I didn’t read anything but my textbooks. As a teenager I was spellbounded by Agatha Christie’s Poirot. I think those who are familiar with David Suchet’s fantastic portrayal of the dumpy Belgian detective know, feel what I am talking about. I owe David Suchet that books appeared in my life and became my faithful friends (I will always be grateful to him for giving me such an extraordinary gift above his wonderful acting). I read the adventures of Poirot, the life of Agatha Christie and Napoleon. I had an experience in connection with Sherlock Holmes at that time. My family members funnily mentioned his name in connection with cleverness. I asked who he was, and the answer was he is a famous detective. I raised further questions: where does he live and what did he do to become famous? But there was no response. I felt it strange that those people who taught me not to use words without knowing their meaning do not know basic facts about him. I bought The Sign of Four because the name of Holmes was on it, but I must confess that its beginning warned me off. I thought Sherlock is a stuck-up drug addict and I put down the book after a few pages. I had one nice memory of him, I really liked The Hound of the Baskervilles cartoon. For me Napoleon was the king of emperors and Hercule Poirot was the king of detectives. Now I know that Napoleon cannot be measured to Alexander the Great, and similarly, Poirot cannot be measured to Holmes – yet, the French emperor and the Belgian detective still remain my favourites. I often felt that every day is difficult and life is nothing but hopeless suffering. Many things just happened with me. When I was an adult I saw the film Facing the Giants by reverend Alex Kendrick. It made me think a lot about my life. I realized I received all the things I asked from God as a child, and some of them eventuated better than I hoped. Of course I am aware of the fact that not all people believe in God, and I do not want to convert anybody, I simply remarked that I believe in God. It is great that Conan Doyle’s hero is a believer too (Common misbeliefs: Sherlock Holmes didn't believe in God). I recognized that I had already tried to do many things with my life, except one: I never tried to love it. From that time I aimed to change this. I agreed with myself that whenever a negative thought comes into my mind, I will find a positive one in connection with its cause. The first week was tough, the second a little better, but still difficult, then on the third week many pleasant ideas emerged in connection with a negative event. I began to think up more and more funny things, and it dawned on me that I can be a happy woman. „At first I wanted to conquer life but it defeated me. Then I tried to see into it but I was lost in its endlessness. In the end I thought I have to map it out but it escaped me. Last, though unwillingly and vaguely, I tried to love it and life embraced me with profuse joy” – said Freitag, and I became as lucky as him. Lots of fantastic people, things and events appeared in my life, and each day was a gift. I started to watch Matt Frewer’s Sherlock Holmes on television, then Jeremy Brett’s portrayal mesmerized me. While having a good time I learned that we are able to get to know life if we observe it. In addition, Holmes offered me several practical solutions. When my muscles were aching, I bought a nice black walking stick to ease my walk (Fortunately I don’t need the stick any more for a long while). My room is dark, just a little light gets in there, yet I know that I should have an Aspidistra. And Jeremy Brett shared with me the greatest wisdom in The Greek Interpreter: „To the logician all things should be seen exactly as they are, and to under-estimate oneself is as much a departure from truth as to exaggerate one’s own powers.” I understood that in order to get to know the world I have to get to know myself – I have to know my shortcomings, my values and my place within the world. I can appreciate work, and the monologue which made me stop reading The Sign of Four turned to be my favourite Sherlock Holmes quote. Using the methods of Holmes may be funny as well. Once we were walking with my father when a woman came opposing to us with a white poodle in her arms. The dog was barking constantly, it was furious. I told my father: „The woman keeps the dog in her arms because it is freshly groomed and she doesn’t want it to be dirty. The dog barks because it is sore at its owner for the torture it had to endure.” My father asked why I think that. I answered that I walked there the other day and I observed that there is a dog grooming saloon. While we were talking, we reached the building. A woman came out and shouted after the other woman holding the dog: „Wait, daughter! You left the bag here!” We laughed heartily, because my deduction was correct. So observing things may be funny. I am not a genius, but thanks to Sherlock Holmes I know that mental abilities can be improved and one can practice to be more patient. I try to be better at present, because I still have to improve a lot. I am well aware of the fact that I will err sometimes in the future, but I can minimize the chance of it. Countless people observed the world around them, for example Buddha, Goethe, Seneca, Gandhi and Marc Anthony – and they all have found their place in it. I had to read many Sherlock Holmes novels to realize how significant is the greatest gift of the Canon. The author of the stories was a man who was very literate and wise already when he was young. Before him many shared their experiences, advice and remonstrances which are useful for humankind. Good examples for them are the aforementioned Seneca or Marc Anthony, but they distributed their knowledge in the form of enumeration. Conan Doyle was an artist, and it was clear to him that he is able to share his wisdom in another way. It was unbelievable for him that the majority of the detectives solve mysteries thanks to good luck, so he created an investigator who combined several scientific methods. While Poirot remained on book pages and tv and movie screens, Sherlock Holmes contributed to the development of criminology. He turned crime solving into a branch of science. It is the undoubted merit of Conan Doyle that we live in a less chaotic world. He presented the adventures of his pipe-smoking genius in a very exciting and realistic way. At the same time he always points out that it is worthy to hope, to seek solutions and to remain humane. It is sad for me to see that his precious legacy is too often treated so badly in book or movie adaptations. The creators of these adaptations forget all the spiritual and moral lessons that lots of unhappy people need nowadays. Holmes, the master of logic, the symbol of deduction, who persinifies moral, is often degraded to the symbol of shallow, material, sexual and violent things – in the name of popculture and media trends. I encourage myself that I believe in the classical Sherlock Holmes, who will live on and who represents true values, no matter what some rapacious people made of him. I do hope this won’t change. Because as Albert Einstein said: „Human beings can only live a valuable and harmonious life when they succeed to free themselves from striving for their material pleasures all the time. Our aim must be contributing to the spiritual values of society.” And the original Sherlock does exactly this. I started the Hungarian Sherlock Holmes website in 2010. I was before a capital operation and I felt really bad. I lived a life full of pain for years. Doctors diagnosed an illness, and a surgeon realized that I need an emergency operation. 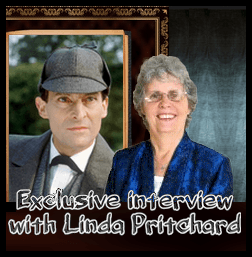 We had to wait a long time for an evidence, and I decided to put up a few lines about my favourite detective, because it was a dream of mine to have a Holmes website, and at that time it was not sure that I will survive the operation. And you have at least try to make your dreams come true….I was lucky. My surgery was successful, I could work again and later I changed from discomfort to optimism. It became clear for me that my hero is a fantastic and unfailing topic which is worth to deal with. I always loved to make websites. Some may say it is automatic work, but my opinion is that a site is from humans to humans about humans. So it is important that the content must be humane. Through the making of the Hungarian Holmes site I got acquainted with actor László Tahi Tóth, who dubbed Jeremy Brett in the Granada series and who is my favourite Hungarian actor. I love his versatile acting, but I am sure that his splendid talent is surmounted by his generosity. The Hungarian site brought a good friend, Revati (You can read more information on her following this link: Revati) into my life, who is not just a great partner to work with, but I also learned and still learn a lot from her. Having seen the quality of our Hungarian site Ales Kolodrubec, the president of the Czech Sherlock Holmes Society contacted us and offered partnership, and what is more, he said that we would be able to stand our ground on international level as well. We truly appreciated his trust. Then we began to work on this English language site sherlockian-sherlock.com. Because our possibilities are strongly limited, we are implied to come up with new ideas all the time – so Sherlock Holmes prompts us to creativity as well. Unfortunately we live far from each other, practically half of the country departs us, however we can harmonize our tasks via Internet on a daily basis and we have time for a pleasant chat almost every evening. She is one of „the best and the wisest human whom I have ever known.” Since I know her I realized that Sherlock Holmes and dr. Watson are not only the symbols of friendship, but they can really bring such wonderful relationships like that into anyone’s life. I enjoy my job and the fact that I learn a lot about the world and people through it. Of course I am fascinated by the mood of the Victorian era, by the excitement of detective stories and by the sophisticated humour that appears in the Canon. So this is the most yearned for, the most interesting, the most instructive journey in my life. It is an unbelievably wonderful experience what I could not have elsewhere. I do hope that the sleuth who changed the world forever will bring as much joy to the life of our readers as he did in my case. My firm belief is that the genius, the Renaissance man and philantropist, Sir Arthur Conan Doyle, who gave him to the world with heroic work and unfailing kindness, will not sink into oblivion. Lots and lots of people like the world’s greatest detective. We would like to know what you love the most in the eccentric sleuth. His genius? His oddity? The fact that he was a pioneer in many things? Or something else? You can share your reasons with us and with the visitors of the site if you want to. You can also tell who is your favourite Holmes actor and why. We gladly accept longer writings as well as short ones. Your opinion may be useful for countless people: fans, Sherlockian club leaders, writers, actors, artists and so on. At the same time please note that basically our site is a cultural one, so we would like to stick to a standard. That is why we reserve the right to filter the received texts. This means they do not appear instantly on the page (unlike on a forum). You can send your mail with your real name or you can use a nickname. Please share with us which country you are from, and you may add how old are you if you want to. Your email address will not be public of course.